Chögyal Namkhai Norbu was born on the eighth day of the tenth month of the Earth-Tiger year (8 December 1938) in the village of Geug in Derge, East Tibet . He was recognised as the reincarnation of Adzam Drugpa, one of the great Dzogchen Masters of the early part of the twentieth Century, when he was two years old. Adzam Drugpa was a disciple both of Jamyang Khyentsei Wangpo (1820-92) the first Khyentsei Rinpoche, and Paltrul Rinpoche (1808-81). Adzam Drugpa was a terton, a discoverer of hidden treasure texts, receiving visions directly from Jigmed Lingpa (1730-98). At the age of eight, the young Norbu Rinpoche was recognised as the mind-incarnation of Lhodrug Shabdrung Rinpoche by both the sixteenth Karmapa (1924-1981) and the eleventh Palpung Situ Rinpoche (1886-1952). The first Shabdrung, Ngawang Namgyal (1594-1651), himself the reincarnation of the great Drugpa Kagyüd master Kunkhyen Padma Karpo (1527-92), was the founder of the Drukpa Kagyüd in Bhutan . His reincarnations were the temporal and spiritual rulers of Bhutan until 1904, when the current monarchy was established. The title ’Chögyal’, meaning Dharma King, is given with this recognition. From a very young age Chögyal Namkhai Norbu received a vigorous spiritual training from the Rimed or non-sectarian masters of East Tibet. Then, from the time he was eight years old until he was twelve, he attended the Sakya college at Derge Gönchen Monastery. During this time he also studied with Jamyang Khyentsei Chökyi Lodrö, at Dzongsar. In 1951 when he was fourteen years old, he received the initiations for Vajrayogini according to the Sakya lineages of the Ngorpa and Tsarpa. He was advised by his tutor to seek out a woman living in the Kadari region, who was regarded as the living embodiment of Vajrayogini herself, and take initiation from her. This woman master, Ayu Khandro Dorje Paldrön (1838-1953) was 113 years old at this time and had been in dark retreat for some fifty-six years. She was an elder contemporary of Adzom Drugpa, as well as a direct disciple of both the great Jamyang Khyentsei Wangpo, and of Nyagla Padma Dündul (1816-61) who attained the Rainbow Body of Light. Chögyal Namkhai Norbu received several transmissions from her including those that he initially requested, as well as the Longchen Nyingthig, and her own mind-treasures. In 1954 he was chosen as a representative of Tibetan youth and was invited to visit the Peoples Republic of China. Subsequently, in 1954 he was appointed as an instructor in Tibetan language at the South-western University of Minor Nationalities at Chengdu , Sichuan , China . It was during this time that he acquired proficiency in the Chinese and Mongolian languages. Following a vision he received in a dream when he was seventeen years old, Chögyal Namkhai Norbu returned to the place of his birth, Derge. He travelled to a remote valley east of Derge where he met his Root Master, Nyagla Rinpoche Rigdzin Changchub Dorje (1826-1961/1978). Rigdzin Changchub Dorje came from the Nyagrong region, further to the east, on the borders of China . He was a disciple of both Adzam Drugpa, and of Nyagla Padma Dündul. He was also a disciple of another famous Dzogchen teacher who attained the Rainbow Body of Light, Shardza Trashi Gyaltsen Rinpoche (1859-1935). 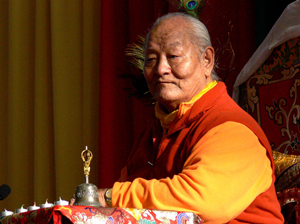 Changchub Dorje was the master of a totally self-supporting community of lay practitioners called Nyagla Gar. Rigdzin Changchub Dorje was a practising physician and Chögyal Namkhai Norbu stayed with him for almost a year, assisting him with his medical practice. He also received initiation into and transmission of the essential Dzogchen teachings from the Semde or ’Series on the Mind’, the Longde or ’Series on Space’ and the Menngagde, or ’Series of Secret Instruction’. More importantly, this Master introduced him directly to the experience of Dzogchen. Chögyal Namkhai Norbu then undertook a long pilgrimage to Central Tibet, Nepal, India and Bhutan. When he returned to his home country of Derge, East Tibet , he found that the political situation had deteriorated with the eruption of violence. He fled this violence, initially towards Central Tibet . He finally emerged as a refugee in Sikkim , and lived in Gangtok, the capital, from 1958 to 1960. While there he was employed as an author and editor of Tibetan text books by the Government of Sikkim , in the Development Office. There he met Professor Giuseppe Tucci, a renowned Tibetologist, who invited him to work in Rome . At the age of twenty-two, in 1960, he took up the position of Research Associate at IsMEO, the Istituto Italiano per il Medio ed Estremo Oriente. In 1964, the position of Professor of Oriental Language and Literature at the University of Naples was offered to Chögyal Namkhai Norbu. For twenty-eight years Chögyal Namkhai Norbu taught Tibetan and Mongolian languages, literature, and Tibetan Cultural History, retiring as Professor Emeritus in 1992.